So here it is, I finally finished Bine’s RR. 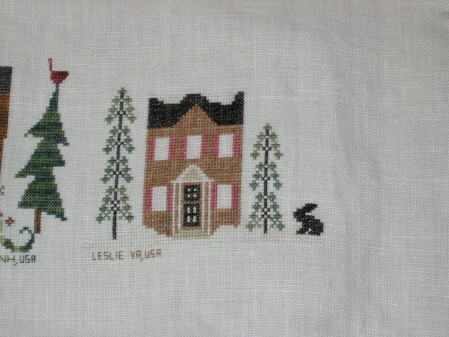 It is the house from CCNs Forest Snowfall. I changed the color of the shutters, but otherwise it is pretty close to the original. I also got Deb’s RR in the mail today and had fun looking through all the goodies she included. I have picked out my piece already and will probably start it tomorrow. I usually like to get these done at the beginning of the stitching window, but had a hard time with this past round because of having Nathaniel. Although I definitely don’t have as much stitching time as I did before, I am typically able to get 30-60 minutes a night. I might even be able to stitch a bit in the mornings if we can ever get to getting up on time. Nathaniel is growing so quickly and such a cutie!!! You and your DH must be so proud. Great finish on your RR. Bine will be so pleased. Congrats on the finish! I’m sure Bine is going to love it. Congrats on the finish. That house is wonderful!